When I was a young boy my brother showed me this tiny little spider on the wall of the house. He would wiggle a thin piece of grass in front of it and the spider would leap forward, grabbing the tip of the grass stem. He told me it was a Zebra Spider and I was fascinated by it, as it appeared to defy gravity by leaping from vertical walls and landing back on them without dropping to the floor. 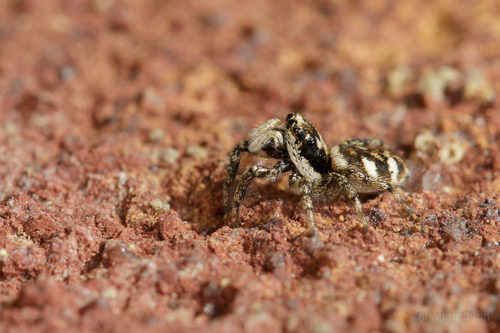 Zebra Spiders actively hunt their prey, so they like to check out every nook and cranny that they stumble upon. 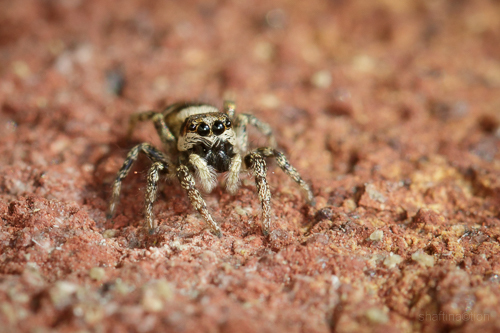 Now i’m a lot older and a tiny bit wiser I know that this spider was one of a family of jumping spiders we have in the UK called Salticidae. 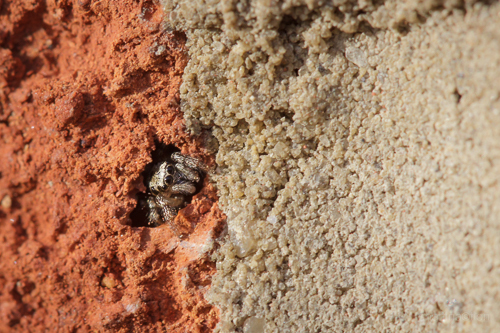 In fact, this one was a Salticus scenicus, meaning ‘theatrical jumper’, one of, if not the commonest species native to britain. My brother was right though, this species is commonly known as the Zebra Spider oweing to its black and white markings. The huge front-middle eyes are actually telephoto. Zebra spiders are charismatic little beasts bobbing and weaving their way along walls and fences, going about their daily business of hunting down insects. Their most prominent, and some would say, most endearing feature are those huge forward facing eyes at the centre called anterior median eyes. These have a fairly narrow field of view, but can focus on objects off to the side as well. They are actually telephoto lenses and offer the most excellent of vision for identifying prey, and judging distances to pounce upon unsuspecting prey. On the outside of these are the anterior lateral eyes, somewhat smaller, but still pretty effective hunting peepers, which have a wide field of view, and help to locate prey, and refine the spiders calculations for jumping trajectories. On top of this they have another 2 pairs of eyes on the top of their body which give the spider an all round view for detecting prey and threats, although one pair (the top middle pair) is thought to be little used in many species of Salticidae. They tackle prey items much larger than themselves. Zebra Spiders eat any insect they can handle although it’s said (and I have witnessed) they do avoid ants, probably favouring easier prey. 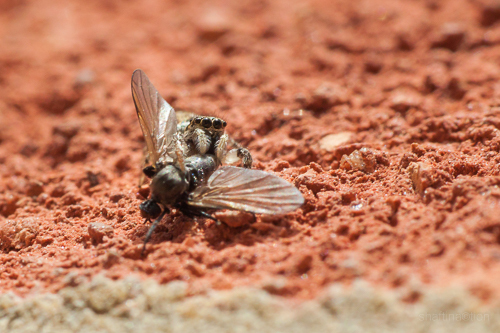 They have fast acting venom which paralyses their prey fast, allowing them to tackle bigger game than themselves. They usually attach a silk tether to the spot where they are standing before jumping so they do not fall when attacking or jumping from place to place. They also use their silk to make a shelter for rearing young and for protection from the elements. If startled they stop and stare at the offending person or threat. Anyway, one sunny afternoon a few days ago I was in the garden and spotted something small moving around on the brick wall. As I got closer its familiar shape became clear. 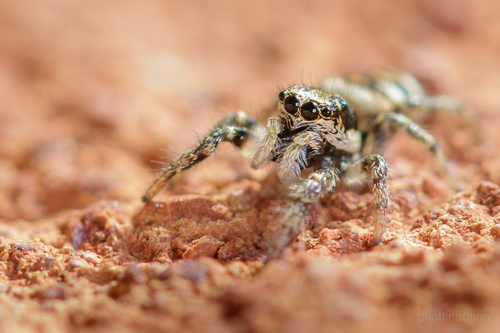 It was a jumping spider, a Zebra spider in fact. A Salticus scenicus, the same spider I had marvelled at all those years ago. Now this was no big surprise as I have seen them on this very wall before as it faces the afternoon sun, and i know that Zebras love the sunshine. If you scan a sunbathed house brick wall carefully enough on any given day you’re quite likely to spot one going about its business. I spent twenty minutes or so following this one around and every now and then, when I got too close she (turned out to be a female) would turn to seemingly challenge me with front legs raised and a gaze (looking through my macro lens) that could mesmerise even the likes of Paul Mckenna. Yes, I have seen many Zebras over the years since my first encounter but every time I watch one it takes me right back to that day when I marvelled at one as a boy. ~ by shaftinactionn on April 13, 2015. A quality bit of writing there my friend, and a great set of pics too!